New thematic signs in The Entertainer’s flagship store in Amersham. Earlier this year Let Toys Be Toys started a social media campaign against the Entertainer, who they named as one of the worst retailers for gendered toy segregation. Let Toys Be Toys commend The Entertainer for responding to consumer opinion but are keen to ensure that the new signs; “Imagine and Play” and “Action and Adventure” which will be pink and blue respectively, will not signify a continuation of gender stereotyping, and that toys will be properly categorised according to theme. We’d also like to thank our followers, who continue to grow in numbers, for making a noise and letting retailers know that we want our children to grow up in a world free of outdated sexist stereotypes. This is a really great start but very disappointing that construction and action and adventure will be blue and imagine and play will be pink. Is there any way to campaign for that to be changed? Thrilled to hear this – I’ll be writing to the Entertainer and Tesco to let them know they’ve done the right thing. I find it disgusting that in this day and age you care about this pathetic excuse of a protest. If you’ve ever been in a toy shop you’d know that kids don’t care if its labelled boys and girls, same as they don’t in clothes shops and shoe shops or are they next on your list. The only people that care are the narrow minded who view pink as being for girls and blue for boys. These days kids are not bothered about colours and I no this from years of experience. That’s true. Looking at the sea of pink in a toy store under the “girls'” sign, it is infuriating that the toy industry sees pink as the only colour for girls. There are so many more colours to choose from. What’s worse is that boys are taught that pink isn’t for them, simply because it is deemed for girls. So, yes, you are quite right to say that colour shouldn’t matter. We agree wholeheartedly. Unfortunately the toy industry has decided otherwise and spends a considerable amount of money forcing their colour-coding onto our kids. We appreciate that this campaign isn’t for you and that’s fine. But many people care about the choices given to our children and that’s not pathetic in the slightest. You might want to read our “Why It Matters” section to see why people feel this way. HI Gemma, Thanks for stopping by to share your opinion. I’m happy to hear that in your experience children are not bothered about colours, and don’t care whether toys are labelled for boys or girls. It would be interesting to hear more about this experience, as we’d love to know more about environments where children do feel free to choose whatever colours and toys they want. And since you mention clothes, yes I do think it’s a problem too. My daughter sadly insists on ‘girls’ shoes’ for school, which are uniformly open to the elements, and mostly very flimsy. Boys’ shoes on the other hand are much sturdier. I only wish she was as strong-willed as the children you know! It’s a shame you feel disgusted by the campaign, but personally, I’m pretty disgusted by people telling my children what they should and shouldn’t like. I fully support this campaign. I have a 7 year old boy who is very diverse in his toy preferences – cars, craft, dolls, dress up, computer games…whatever. He is distinctly and painfully aware that ‘pink’ toys are not ‘supposed’ to be boys toys, too. We haven’t taught him that. The toy retail and advertising industry has a very powerful voice. We teach him, ‘it’s not for girls, it’s just in a pink package’ but we shouldn’t have to!! I have contacted The Entertainer over this as, although they have changed their headers, their underlying message has not changed. Even the floor is pink as you enter the ‘Imagine and play’ section. They wouldn’t really discuss it with me. They implied it is solely parental input that is responsible for the issue… I was unimpressed and am absolutely delighted to find this organisation and this campaign! As was my son when I told him people were fighting to just let children play with whatever they choose to enjoy. This matters. It really matters. Children are being manipulated and pigeonholed when they should be free to play and learn, comfortable and confident in their own skin. And, I ought to add, we are not teaching him ‘pink is for girls’ either – he says he is sure girls must like lots of other colours too because he likes more than one colour so why do they only get to choose pink…? I have just been in to The Entertainer’s shop in Didcot (April 2018). 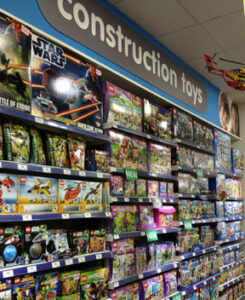 The ‘imagine and play’ headed section is backed in pink with a picture of a girl, the ‘action and adventure’ and ‘construction toys’ sections are both backed in blue with a picture of a boy. If they think removing the words boy and girl is enough to join the modern world, they are mistaken. The tokenism of this disgusts me. Let toys be toys! 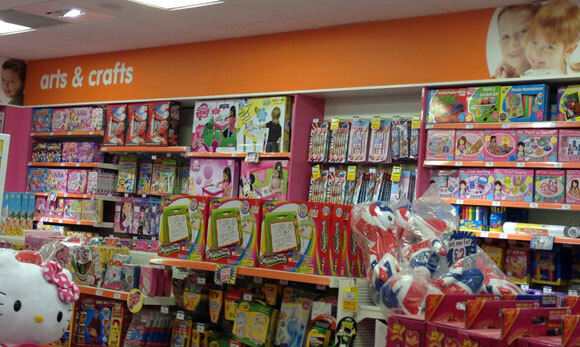 ← Gender signs – what do independent toyshops think?